Surftech is a international technology transfer company specialized mainly in the field of surface treatment technologies and hi-barrier technologies. We are working very closely together with institutes such as Fraunhofer, TNO, etc. We are based in Brussels and in Tokyo, enabling us to have good communication between Japanese companies with specific needs and the European technology sources. 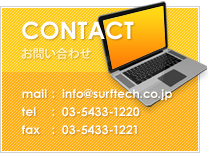 Copyright © 2019 Surftech Transnational Co.,Ltd All Rights Reserved.